Como su Consejera de Asistencia y Servicios Estudiantiles, estoy disponible para ayudar a mejorar la asistencia de estudiantes individuales y de toda la escuela ayudando a los estudiantes que tienen dificultades debido a barreras sociales/emocionales, del hogar, y comunitarias. Por favor contactame para preguntas relacionadas con la asistencia o preocupaciones. Students who are late to school must obtain a pass to class from the front desk. Students should bring a note from a parent/legal guardian to clear the tardy. The third unexcused tardy, 30 minutes or more, is considered truancy and will be handled according to state truancy laws. Students who refuse to attend school regularly and have received truancy letters 1 and 2 are subject to a SART meeting with the PSAC, counselor, teachers and administration. Parents are mandated to attend with 2 week notice. After signing contract, parents are responsible for ensuring their student attends school. 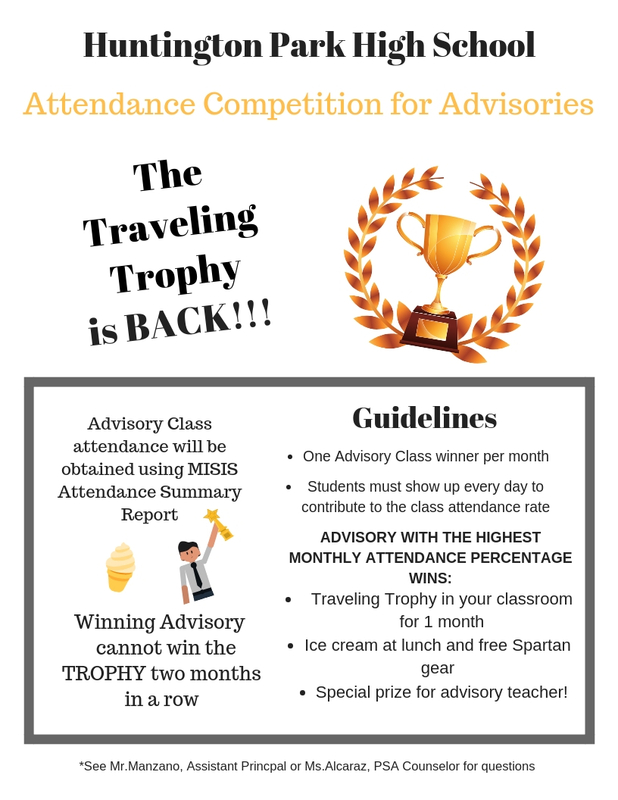 Students should have less than 7 absences in a school year in order to have excellent attendance. Notes from parents/guardians explaining reasons for absences are REQUIRED for every absence. Notes must be submitted to the Attendance Office within 2 days of the absence. Notes should include student's full name, birthdate, reason for absence, parent's/guardian's name and phone number. Notes do NOT erase absences. Parents/guardians do not need to call the school for a student arriving late to school. A note as listed above can accompany the student for any excused tardy. Maintaining good attendance can result in high school diploma and better preparedness of students. The chart below shows that 9th graders with less than 4 absences in a school year are more likely to graduate in 4 years. Students with more than 9 absences encounter more challenges toward graduating on time. 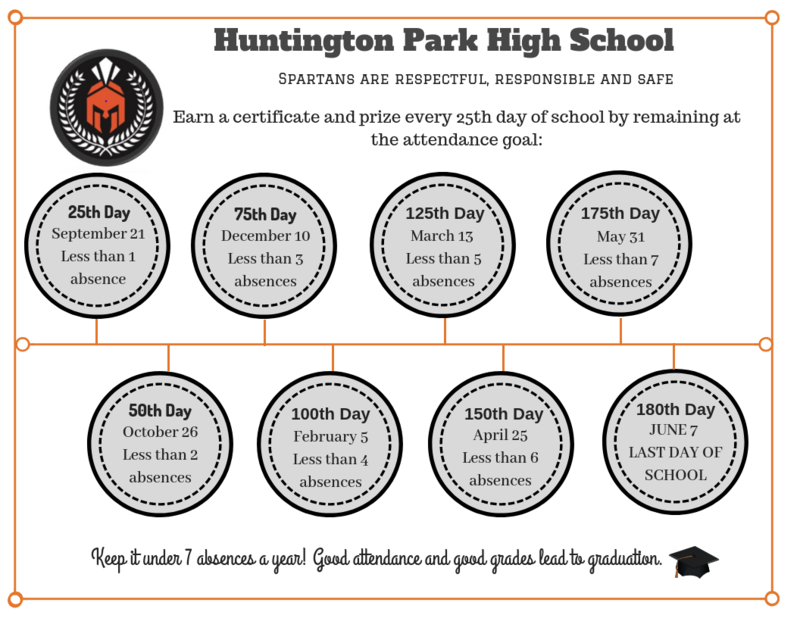 We care about students' attendance at Huntington Park High School. Spartans who attend school regularly and are at the 96% goal earn a certificate every 25 days. Below is percentage of students at Huntington Park High School who were considered chronically absent by the end of the school year. A reduction in percentage means HPHS is improving their chronically absent data through interventions. Below are the percentages of students at Huntington Park High School who were considered to have excellent attendance by the end of the school year (7 absences or less). An increase in percentage means HPHS is improving their excellent attendance data through interventions. New enrollee's who are interested in attending Huntington Park High School and are within our zone of choice area, can print out the zone of choice application, fill it out and bring it to the attendance office. This can be done Monday through Friday between school operation hours 7am-4:30pm.